The performance of the MethylDetect kit has been tested on the LightCycler® 480 High Resolution Melting platform (product number: 05015278001) and LightCycler® 480 High Resolution Melting Master (product number: 04909631001) PCR reagents in 96 well plates. The use of this platform is recommended in combination with the MethylDetect kit. Other RT-PCR systems capable of performing high resolution melting (HRM) can be used following further optimization of the experimental conditions. The MethylDetect kit is shipped at room temperature. When stored at -20°C the reagents are stable through the expiration date printed on the label. When opened keep stored at -20°C. Avoid repetitive freezing and thawing of the kit components. Shipping and temporary storage for up to 8 weeks at 4°C has no detrimental effects on the assay performance. For storage conditions of the LightCycler® 480 High Resolution Master Mix, the associated protocol can be consulted for further details1 . High Resolution Master Mix (containing Taq polymerase, reaction buffer, dNTP mix, HRM dye, MgCl2, and water, PCR grade). An instrument combining Real-Time PCR with high resolution melting capability. 96 well plates or reaction tubes compatible with the Real-Time PCR and HRM instrument. Pipettes with disposable, positive-displacement tips. Sterile reaction tubes for preparation of master mix. Optional: Standard swinging-bucket centrifuge containing a rotor for multiwell plates. The MethylDetect kit is designed and optimized for detection of DNA methylation status of the specific gene promoter region in a human DNA bisulfite converted genomic DNA. DNA, representing methylation positive, assay calibration, and methylation negative controls, are supplied with the kit to ensure optimal performance of the assay. The cycling program for the MethylDetect kit includes 10 min pre-incubation and 50 cycles of amplification followed by high resolution melting and will last for approximately 90-120 min when performed using the LightCycler®480 System. As a general rule, when using PCR for methylation studies, all DNA samples have to be bisulfite converted, to ensure preservation of the methylated cytosines in the template 1. Figure 1. The preserved methylated cytosines, which are part of a CpG dinucleotide, are underlined and in red. The unmethylated cytosines are converted to uracil, and further substituted with thymine during the PCR, and are illustrated in blue. After bisulfite conversion the DNA strands are no longer complementary, and will appear single-stranded. Following bisulfite treatment the methylated DNA sequence is different from the unmethylated, as unmethylated cytosines are converted to uracil, and methylated cytosines remain unchanged. 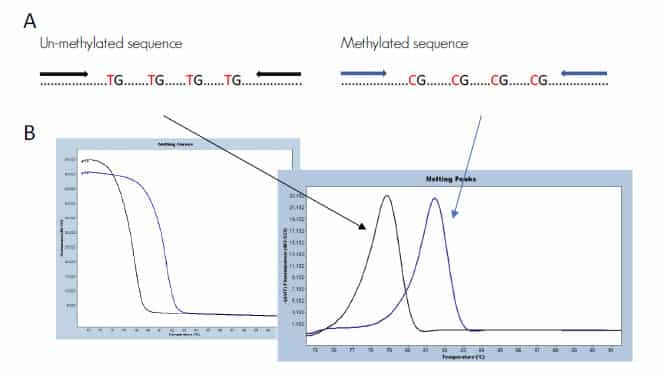 After PCR, the products will have different melting properties, and the resulting profile after HRM allow for discrimination between methylated and unmethylated templates, respectively (figure 2). Figure 2. Schematic illustration of the principle behind HRM analysis. A) the difference in a DNA sequence after bisulfite conversion of a methylated and an unmethylated genomic region. B) the difference in melting properties of the PCR products from the methylated (blue) and the unmethylated (black) templates. Use 50-100 ng of bisulfite modified DNA per reaction. This is a theoretical concentration based on the DNA input for bisulfite conversion and the elution volume. Commercially kits are available for bisulfite conversion of the sample DNA. In the current version of the MethylDetect kit, we recommend the use of bisulfite conversion kits from Zymo Research to process DNA samples prior to methylation analyses.
! Follow the instructions from the bisulfite conversion kit for storage of the DNA after treatment 2. The quality of the DNA should be suitable for PCR in terms of concentration, purity and absence of PCR inhibitors. Use of same DNA extraction procedure for all samples may eliminate any subtle differences in the high-resolution melting results, which could have been introduced by a difference in reagent components. To ensure sufficient quality of the DNA prior to bisulfite conversion, agarose gel electrophoresis or analysis by a Bioanalyzer can be used to assess the DNA integrity, and Qubit Fluorometer is recommended for measuring the DNA concentration. A methylation positive, an assay calibration, and a methylation negative control are supplied with the MethylDetect kit, and ready for use. The assay calibration control is included to ensure the assay sensitivity to detect methylation of 1%.
! The methylation positive, the assay calibration, and the methylation negative controls are not to be bisulfite converted. The controls are each applied in duplicates or triplicates to all multiwell plates. A No Template Control (NTC) should always be included in each analysis. The NTC contains the same reagents as the reactions for analyses, except that the DNA sample is replaced with the same amount of PCR grade water. The NTC should be present at each multiwell plate in duplicates or in triplicates. A primer set is supplied within the MethylDetect kit, and the PCR assay conditions are given in the Protocol table. The optimum MgCl2 concentration is essential to enhance amplification after bisulfite modification and thereby highly important for the high-resolution melting result. The recommended MgCl2 concentration for each specific kit is provided in table 1. The protocol is calibrated using the LightCycler® 480 High Resolution Melting Master and the associated protocol can be consulted for further details 1. Follow the procedure below in the given order to prepare one 20 ml standard reaction. Thaw the solutions and spin all tubes briefly in a micro-centrifuge before opening, to ensure that the content is collected at the bottom of the tube. -store all reagents on ice. Prepare the PCR mix for one 20 ml reaction by adding the following components in the order listed below and keep it on ice. 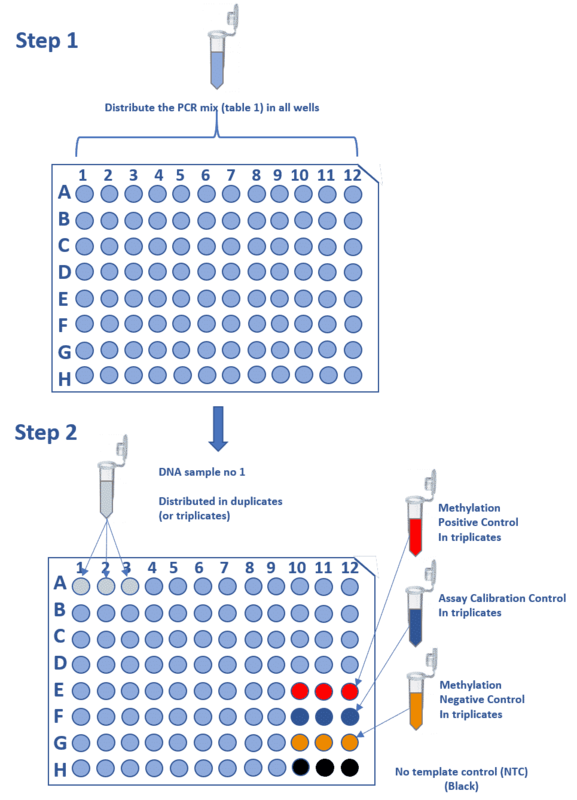 To prepare the PCR mix for multiple reactions, multiply the volume for each component with the number of reactions, including the standard control samples (methylation positive, assay calibration, and methylation negative control DNA) and the NTC in triplicates, adding extra reactions to compensate for loss of reagents during pipetting (we suggest for a 96-well plate prepare 100 reactions).
! For plate setup see figure 3. To prepare a 96-well plate, in which all samples are analysed in triplicates: use 28 test samples (84 wells) + three different standards (nine wells) + NTC (three wells) = 96 wells. Pipette 14 ml PCR mix into each well, including the wells to contain the positive, the assay calibration, the negative, and the no template controls. Add 6 ml bisulfite treated DNA, corresponding to a theoretical calculated value of 50-100 ng For optimal performance, the amount of template was tested in the range of 50-100 ng. Lower amount of template can be used however, we recommend that the assay is optimized to the specific DNA concentration before processing the test samples.
! For each multiwell plate, add 6 ml of each standard control DNA provided in the kit (methylation positive, assay calibration, and methylation negative), preferably in triplicates. Seal the multiwell plate with an appropriate sealing foil. Place the multiwell plate in the instrument and start the PCR-HRM program. The results presented below were obtained following the MethylDetect kit protocol, using the LightCycler® 480 High Resolution Melting Master. After the amplification part of the program, the amplicons are analysed by high resolution melting curve analysis, and the data evaluated using the LightCycler® Gene scanning software. Figure 4. Normalized melting curves illustrating methylation positive control (red), the assay calibration control (blue), and methylation negative control (orange) of the gene specific templates supplied with the MethylDetect kit. Figure 5. Relative signal difference (d/dT) plot illustrating the methylation positive control (red), the assay calibration control (blue), and methylation negative control (orange) of the gene specific templates supplied with the MethylDetect kit. The protocol was calibrated using the LightCycler® 480 High Resolution Melting Master and the protocol specific for this kit can be consulted for troubleshooting 2 . Methylation-Sensitive High-Resolution Melting (MS-HRM) is a high-throughput technology for highly sensitive DNA methylation analysis of single loci 2,3. The technology utilizes the difference in melting properties of the PCR product amplified from methylated and unmethylated DNA strands after bisulfite conversion. The inclusion of standard DNA with known DNA methylation status ensures a highly sensitive read-out of the methylation of the test DNA. MS-HRM was shown to differentiate between methylated, un-methylated, and heterogeneous methylated templates, which have clearly distinguishable profiles after High-Resolution Melting (HRM) 4 5 6. Clark SJ, Harrison J, Paul CL, Frommer M. High sensitivity mapping of methylated cytosines. Nucleic Acids Res. 1994;22(15):2990-2997. Wojdacz TK, Dobrovic A, Hansen LL. Methylation-sensitive high-resolution melting. Nat Protoc. 2008;3(12):1903-1908. Wojdacz TK, Dobrovic A. Methylation-sensitive high resolution melting (MS-HRM): a new approach for sensitive and high-throughput assessment of methylation. Nucleic Acids Res. 2007;35(6):e41. Wojdacz TK, Windelov JA, Thestrup BB, Damsgaard TE, Overgaard J, Hansen LL. Heterogeneous and low-level methylation of novel biomarker candidates for breast cancer clinical management. Cancer Research. 2014;74(19). Bock C, Halbritter F, Carmona FJ, et al. Quantitative comparison of DNA methylation assays for biomarker development and clinical applications. Nature Biotechnology. 2016;34(7):726-+. Hussmann, D. Hansen, L.L. Methylation-Sensitive High Resolution Melting (MS-HRM). Methods Mol Biol. 2018;1708:551-571. For Research use only. Not for use in diagnostic procedures. Version 8.